2802 - 3763 Sq. Ft.
Experion Windchants Apartments - The luxury way of life. Living in a metropolitan becomes full of pleasures when the abodes and the neighbourhood harmonize each other. Welcome to Experion Windchants Apartments, where this is possible. Located at Sector 112 Gurgaon on Dwarka Expressway 2 BHK, 3 BHK Small, 3 BHK Large and 4 BHK Apartments with premium indoors and a range of amenities completely dedicated for the inhabitants of Experion Windchants Apartments Gurgaon Sector 112. These luxury homes and community living experience is definitely a plus point. How wonderful living it would be to inhabit in a community that offers a very comfortable and opportune life. Luxury home in the middle of greenery is the special feature here - each apartment in this community brings you luxury experiences beyond your imagination. 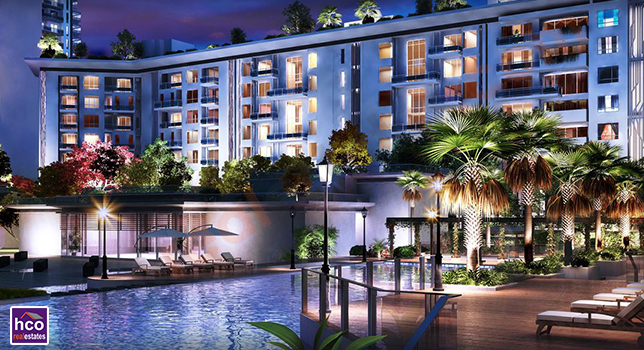 Experion Windchants Apartments Gurugram is nestled in Sector 112 on Dwarka Expressway – a location that advantages outstanding proximity to a range of prime locations of Gurgaon. No matter what your everyday life need is, you'll definitely have access to it within a few minutes. Experion Windchants Apartments boasts marvelous connectivity with reputed schools, colleges, commercial developments, malls, retail stores, healthcare destinations and everything else that a convenient lifestyle needs.